Mountains in BushBuckridge during day time. Bushbuckridge (Afrikaans: Bosbokrand) is the main town in Bushbuckridge Local Municipality, Ehlanzeni District, Mpumalanga, South Africa. The name Bushbuck Ridge was given because of the large herds of bushbuck found here in the 1880s, and the prominent WNW-ESE ridge in the southeastern part of the municipality. The town of Bushbuckridge grew around a trading store that opened in 1884. 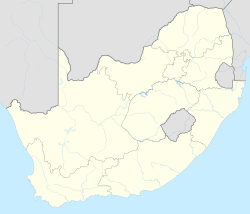 The suburbs and rural areas to the south of Bushbuckridge constitute a "sub place", called Bushbuckridge NU with a 2011 population of 1070, covering 1,587.56 square kilometres (613 sq mi). ^ a b c d e "Main Place Bushbuckridge". Census 2011. ^ "Bushbuckridge NU Sub Place from Census 2011". Adrian Frith. Archived from the original on 20 August 2015. This page was last edited on 22 March 2019, at 21:31 (UTC).